Leading up to Christmas, students in PreK-12 at Lancaster Mennonite campuses have and are running food and gift drives for local families in need this year. 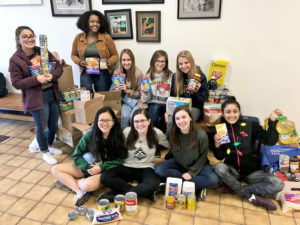 High school seniors at the Lancaster Campus initiated a food drive all of November after being inspired during a Senior Service day at The Factory Ministries in October. The food was donated to the food pantry at The Factory, which provides food and other services to their community. At Locust Grove, elementary and middle school students partnered with Conestoga Valley to collect stocking stuffers like gift cards, toiletries, toys and more for families in need. Pre-K through 5th grade students at the New Danville campus brought in canned goods for local families. Our Hershey campus elementary students participated in a project to benefit Arm of Hope, which is able to send a child to school in Ghana for $1 a day. The ministry pays for school fees, uniforms, school supplies, medical help and a week of summer camp with the hope that children can leave the slums. There goal was to raise raise money to send several children to school for the year. Middle and high school students raised funds to support the Bethesda Mission in Harrisburg. MS and HS students raised the funds by hosting a community day.